Collected in and under washed-up wrack mounds near the Seacoast Science Center as part of the annual all-species bioblitz. I had built a set of large, nesting sifters that I filled with arthropod-rich kelp deposits of varying ages and degrees of dryness and decay. After some thrashing and shaking, the sieves were emptied and the bottom tray examined for arthropods. These earwigs were partial to the more moist deposits, which were also teeming with shrimp-like amphipods. 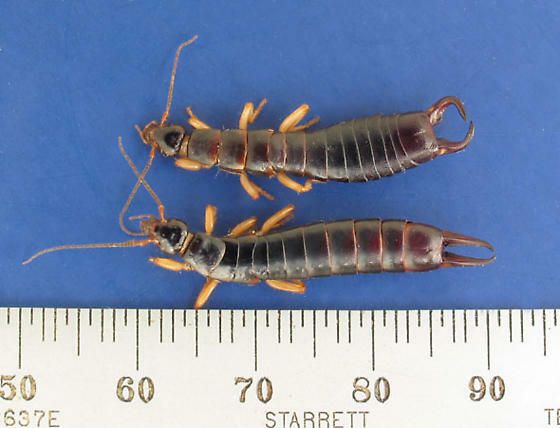 I witnessed three or four earwigs carrying amphipods around in their clasped pinchers or forceps. One had bent its body around to nibble at the trapped crustcean in its forceps, apparently undisturbed by the fact that it had only a moment earlier been evicted violently from its wrack heap. Here you see an adult male and female. The male has the markedly curved forceps. Unfortunately these were among specimens killed for ID as the chief ID person was breaking down his scope and light. I would have preferred a live shot. I actually did bring home one live male that I'll post pix of separately.